My kids were on Spring Break Wednesday-Friday of last week. By the time they came home Tuesday afternoon, we were all more than ready for a little time off. As soon as they walked in the door, they dropped their backpacks and kicked off their shoes. The two youngest ones immediately went off to play together. When my oldest got home, she plopped in front of the TV with the iPad in her lap. Me? I went to my happy place - my office. I sat in front of my computer reading blogs, cruising Facebook, and even typed a blog post. Then, after a while, the mommy guilt began to set in. "It's not good for her to sit in front of the TV for so long" I heard in my head. "I really should be doing something WITH them." "This is an excellent opportunity for that elusive quality time and you are not taking advantage of it!" I let the words resonate for a few minutes and thought about what kind of quality time I could create. It was a dreary, rainy afternoon, so anything outside was out of the question. We could have watched movie together, but that was just more screen time. We could have baked something together, but that would have led to arguing, I'm sure, and sweets that none of us need to eat. Then, I had a mother thought. It occurred to me that, at that moment, everyone was perfectly happy! No one was whining or complaining about homework or chores. No one seemed disappointed by this supposed lack of quality time. In fact, the only sounds I could hear beyond the "voices" in my head were calm and quiet interlaced with giggles and a little TV noise. It truly was blissful. Why would I ever even consider disturbing that peace??? Was it because, while trolling Facebook, I saw pictures of friends on beaches or at Disney for Spring break and I felt guilty that our plans did not include any travel?? Was it because, while perusing Pinterest, my lack of craftiness was excessively apparent and I felt inadequate? Or, was it just because, as mothers, we always want to give our children the best we possibly can and we put way too much pressure on ourselves to be at the top of our game all the time? The truth is, we were coming off a couple of super busy, hectic, and stressful weeks - ALL OF US. My children needed some time to chill out and decompress just as much as I did. They needed some time to "veg out" and relax; to not think about school or activities or what else needed to be done. They needed some time to just be and so did I. So you know what? I let it ride. I let them play and watch TV and do absolutely nothing. I continued reading blogs (which is relaxing for me) and chatting on Twitter. Amidst the calm of that afternoon I realized . . . . .
Not once have any of us regretted any lost quality time from that afternoon. We were spending our time doing exactly what we needed and wanted to do. It wasn't the traditional definition of "Quality Time and Family Togetherness," but it was still relaxing and rejuvenating. Everyone was happy and content. We put a lot of pressure on ourselves these days to be the best at everything whether it's an occupation or parenting. We fall victim to comparison and feel like we are not good enough or that we should be doing better; doing more. The truth is, we are already doing ENOUGH - very often, much more than enough. We don't have to push so hard all the time to make every second purposeful and productive. Sometimes, it's o.k. to just unwind and not do much of anything at all. It doesn't have to be quality time all the time. Or, maybe it's just a different kind of quality . . . . . . . . I'm with you. We do a ton of stuff with our kids. I don't care if they watch tv or play on the computer, because they do plenty of other stuff too. Sometimes it's just fine! Amen sister!! I get that mommy guilt sometimes but then I realize that if no one is fussing then they are happy and content. Sometimes we all need time away from each other to be ourselves. Not to mention that not creating a slew of activities to do with and for our kids allows them to learn how to entertain themselves and just be. Plus think of how much more you all then appreciate the quality time together when you have it. There is definitely that different kind of quality - the rhythm in everyone doing their own relaxing thing. I'm having that RIGHT NOW! The kids are playing with each other in their room and I'm cruising blogs, which relaxes me too. Although the dog kept making chewing sounds and then when I looked down at her, she'd just look normal and like she was doing nothing. My instinct told me she was hiding something and sure enough I just pulled a Cinderella button out of her mouth. The punk. Thanks for this. Ever since my son was born, I've had countless people tell me to enjoy every minute because it goes so fast. I've taken that quite literally to the point that things never got done because I was always spending time with my son. It wasn't until about 6 months ago when I realized it's fine if I take a few minutes to myself. I need a breather too! Sometimes everyone just needs a little down time. Ha! Cruising blogs relaxes me, too. When they are happy and playing together, there is just no reason to rock the boat. Except to save Cinderella buttons and adorable puppies. Oiy, yes, I have wondered if sometimes society takes the "cherish every moment" "ZOMG there's only 936 weekends with your child until they graduate!" business a little too far! I've found that as my kids get older and have more school pressures, they need that decompression time even more. I completely agree with you, Lisa! YES!!! Preach it. You are so right on with this, Lisa- good for you! THIS IS SO GOOD, Lisa! (So good that I'm typing in all caps, and I'm generally against that!) Thank you -- needed this today! Thanks Robin! You are very welcome. Glad it was something that helped you today. On a Friday after school, my daughters just love to relax in front of the TV. They've had a long week! I think you're right....it's definitely a different kind of quality, which doesn't make it bad! I think quality time is a tiny part of the picture. We are all about quantity time in our home. It's that which allows those spontaneous opportunities for our kids to laugh and share and open up. 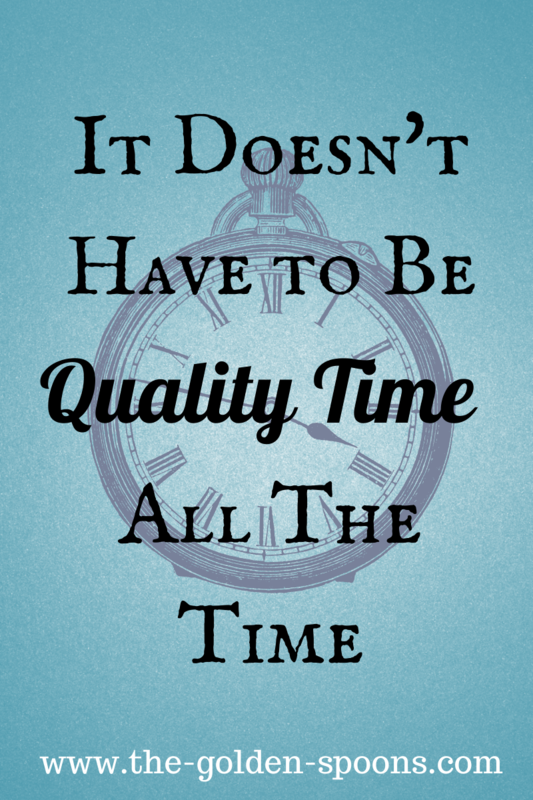 Quality time matters, but quantity time is what I find the most important.